It is painful to watch the prime minister "pleading" with EU leaders to grant another extension to the Brexit date, Arlene Foster has said.The DUP leader told the BBC she found it "humiliating that we are having to go and beg so that we can leave".On Wednesday, a special EU summit will take place as leaders consider Theresa May's request.The UK is still scheduled to leave the EU on 12 April, unless a delay is agreed.Mrs May is meeting German and French leaders on Tuesday afternoon, in a bid to seek support to postpone the Brexit date again. 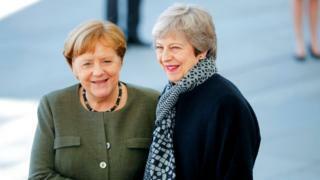 The prime minister met Angela Merkel in Berlin, and will meet Emmanuel Macron in Paris, as she urges both to back her request to delay Brexit again until 30 June.After the talks, Ms Merkel said a delay that runs to the end of the year or the start of 2020 was a possibility.But Mrs Foster criticised the Prime Minister saying she "needed to be strong, she needed to show leadership, and I'm sorry to say that hasn't been evident in this past couple of months". However, when pressed on the future of the confidence-and-supply pact her party shares with the government, Mrs Foster said who leads the Conservatives is not a matter for the DUP.She insisted that the DUP would work in the interests of unionism and would work with whoever was prime minister, but she said it was disappointing that the Irish border backstop still had not been dealt with. "She is the leader of a party that said they would deliver on Brexit and at the moment she is failing to do that," she added.Meanwhile, the Taoiseach (Irish prime minister) Leo Varadkar has said he is "confident" an extension will be agreed at the EU summit. require(['https://news.files.bbci.co.uk/include/newsspec/19077-brexit-glossary/assets/embed/js/embed-init.jsMr Varadkar added that the Irish government had no objection to a long extension, but he did not want to see that leading to the re-opening of the Withdrawal Agreement.He said there were certain dates in the text that would expire if the extension was too lengthy, that could lead to the agreement having to be amended.